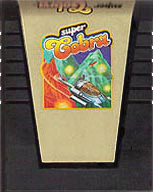 ColecoVision.dk presents: Super Cobra © 1981 by: Konami Industry. / Stern Electronics. 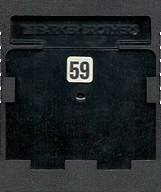 Initially © and Licenses: Konami Industry Co., Ltd., Stern Electronics Inc.
ColecoVision Graphics Programmed by: Konami Industry Co., Ltd.
ColecoVision Manual # and Manufacturer: None, Parker U.S.A.
ColecoVision Box # and Manufacturer: 9850, 0 73000 09850 6 Parker U.S.A.
Air surveillance of enemy territory. Success depends on how far you can penetrante enemy airspace. Can you handle the pressure ?. Because the further you go, the more difficult the mission becomes. Show that you've got what it takes by maneuvbering your chopper around craggy moutain, peaks, through deep dark tunnels, over tall city buildings. All while you face enemy tanks and missiles and weird sky-flying weapons. But you can fight back with high-flying, quick-thinking, fast-reaction moves. Good luck and good flying. XName: Tom Duncan. XName: jblenkle. XName: Ole Nielsen. XScore: 71.210 - September 22, 2004. XScore: 161.540 - December 16, 2011. XScore: 7.050 - June 12, 2011. ColecoVision.dk Game # 59, Super Cobra is last updated: December 8, 2017.